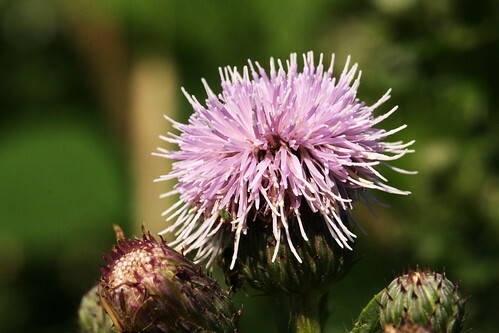 Creeping Thistle ( Cirsium arvense) Creeping perennial with upright, unwinged stems. Widespread and very common on disturbed ground and in grassland. Leaves are pinnately-lobed and spiny. The pinkish lilac flower heads, 10 15mm across, appear in clusters JuneSeptember. Height up to 1m.